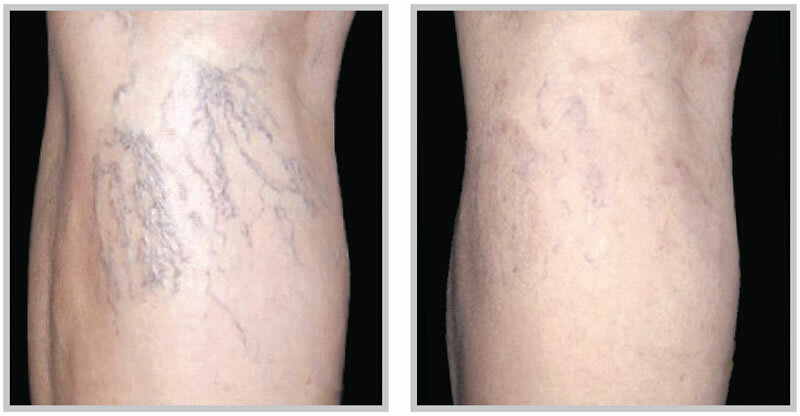 Sclerotherapy is done with a salt based solution that is injected into the veins to reduce unwanted spider veins. Here at Laser Creations we provide options for patient comfort using numbing and/or cold therapy during each treatment. Injecting the unwanted veins with a sclerosing solution causes the target vein to immediately shrink, and then dissolve over a period of weeks to months (depending on size of the vein) as the body naturally absorbs the treated vein. Area can appear bruised or brown in appearance during healing process. Post procedure requires compression stockings to be worn 2 – 3 weeks for optimal results. Laser treatments are provided using the ND-YAG, or Intense pulse Light therapy. Laser Vein removal is easy, fast, and effective way to treat superficial veins Laser therapy has been used for over 30 years. Advances in technology have helped developed many different Lasers. The laser used a focused beam of light. In the treatment of veins, the wavelength of light is targeted to the pigment in the blood. The laser heats up the small vein and destroys it. The laser beam is focused and does not damage the nearby tissue. Over a period of four to six weeks, the vein is reabsorbed by the body and disappears. The most common laser used to treat spider veins is the Nd:Yag Laser system. It is a hand held device and also has a cooling tip to minimize the discomfort during treatment. Intense Light Therapy: This therapy uses intense pulsed light to selectively damage abnormal veins including small spider veins and small vascular defects. This treatment is used on spider veins that can’t be treated effectively by injection or the Laser treatment. Spider Veins vary from person to person, so the number of treatments can vary from two to six treatments at intervals of approx. 4-6 weeks apart depending on the size and number of veins being treated. Facial veins differ from leg veins and the number of treatments can be substantially less. What is the downtime? 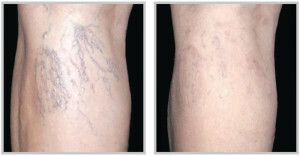 Downtime for Spider vein treatments is determined by size of vein. For Sclerotherapy Support stocking need to be worn for 2 weeks post treatment. The veins themselves will begin to change color usually from Blue to Red then a light brownish color. This is due to the body breaking down the unused vessel. For Laser treatments the down time is less due to the size of vein being treated.